← Meet Holly, Our Newest Soak Contributor! We are back from an exciting weekend at Vogue Knitting Live. There were a shocking number of requests from those of you not attending VKLive for our new and exclusive Maven Gift Sets. We are thrilled with your passionate responses to our product launches. We decided to hold a few back, so you (try to hold back the excitement) can buy them from soakwash.com without having been at VKLive. Each skein of Solemate yarn is signed and numbered. The Heel included is our famous and wildly popular Cucumber scent. We’ve included a Lacey (what else?) minisoaks as well. No excuses now. Get one and get knitting. I’m aspiring to have a skein on needles by the time I head off to TNNA Thursday. We shall see! While you are shopping with us, support The Heart Truth® by ordering our StitchRed gift set. Five percent of gross profits from sales from this Flora gift set will benefit the Foundation for the National Institutes of Health (FNIH) in support of The Heart Truth®. This great program was created by our friends at JimmyBeansWool.com. There are several other products available, from all your favorite knitting industry companies. You may have not heard, but Flora as been put on the side lines, giving space to new fragrances, so this is the only way to purchase Flora Soak at this time. We’re off to catch up and prepare for TNNA. 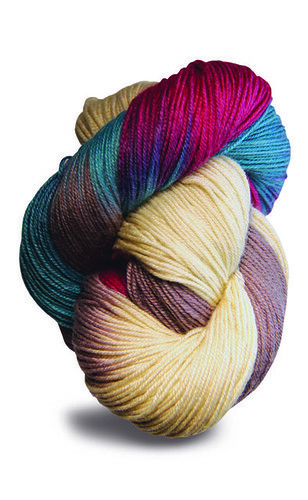 We can’t wait to see what you knit with Maven (and how happy your hands and feet are with matching Heel). Don’t forget to send pictures! Enjoy!